• The "Baths and Shower"
• The so-called new house "Van Robais"
• Max Lejeune 1934 à 1978. 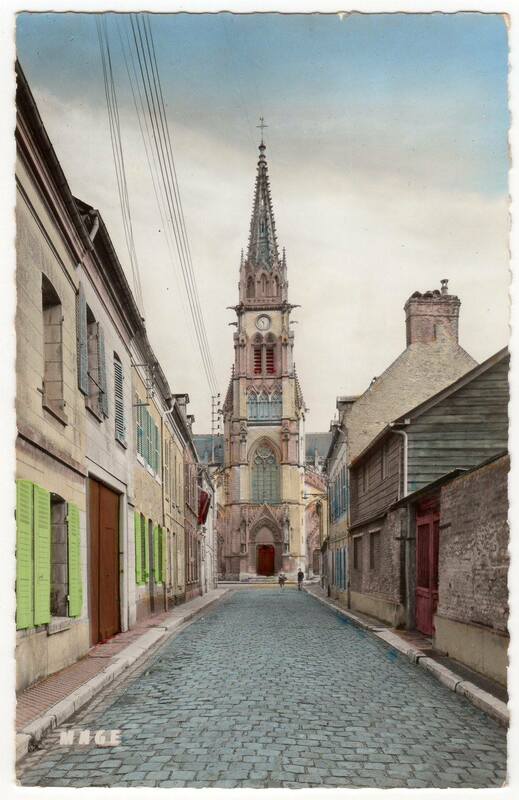 The church of Saint-Jacques, as it was known, was already the third of the name. Indeed, a first church already existed in the XIIth century, rebuilt in 1482, demolished in the XIXème century to be rebuilt soon after and finally defeated in 2013. The very first traces of this church, made of sandstone and very solid bricks, are found in 1136 when the original church was then built extra-muros as Hermant relates in "History of Ponthieu". Its foundations were discovered in 1868 when the third church of the name was erected. The first church was demolished and another larger church, composed of three wooden aisles, was built in 1482. At that time the bell tower was separated from the church itself, containing 10 bells, One was the largest in the city. In 1736 it was taken down from the belfry and exposed in such a way as to encourage the faithful to make a donation in the hope of a recasting since it was split, probably dating from the construction of the bell tower, that is to say Late fifteenth century. It was actually remodeled and renovated in 1737. "In the year 1737, I was blessed by Louis de Valois, licentiate in theology, parish priest of the parish church of Saint-Jacques. I am named Jacqueline and I have been recast the gifts and liberalities of parishioners and Brotherhood of the Holy Spirit erected in this church, Mr. Jacques Homassel, administrator of the said brotherhood, Louis Le Guay, native of Paris and founder of Abbeville made me. The story of Jacqueline is just beginning. Four days after his blessing, a violent storm comes to strike the bell tower. During the Revolution, a popular riot was opposed to Jacqueline's descent from her cabin. That of Notre-Dame de Boulogne at the beginning of the choir, the very one who supports Christ. That of Notre Dame de la Pitie, situated higher up in the nave "third pillar" after Prarond. In 1747, repairs to the level of the Sacristy which was in the first place an open chapel. In 1752, suppression of the Holy Sepulcher in order to give more places to the faithful. These repeated floods did not cease until the lock of Saint Valéry was established and the transit channel of Abbeville opened.In February 1823, a part of the city was flooded, forcing the inhabitants of the Saint-Jacques district to take refuge on the first floor of their dwelling. During the winter of 1798-1799, the thaw brought floods such that the parish was partly submerged and could only be circulated by boat. The cemetery still attached to the church is often filled with water and requires many repairs. Indeed, at that time, Abbeville and especially the Saint-Jacques district, is very often submerged by the waters of the Somme. In 1773, the church suffered great damage. Nevertheless, the church was slowly falling apart and was being torn down. The cemetery was removed to create the Saint-Jacques square, the church giving more and more to the inhabitants the impression of sinking into the marshy soil. In September 1868 the work of the new church began. The old bell tower was demolished, Jacqueline and her sisters ring again in the new building whose first stone is laid on May 4, 1870. In neo-Gothic style, Saint-Jacques was consecrated once again in 1875. Its architecture and fine lines make it one of the most beautiful churches of the Somme but which will never, for its misfortune, ever be listed or classified. His architects Victor Delefortrie (1810-1889) from Lille and his son Paul (1843-1910), born in Tourcoing, are two references in architecture architecture in the second half of the 19th century. During the First World War, Saint-Jacques was not touched but explosions caused the windows to burst. The municipality of the time decides its repair (181 Frs). In 1937, the mass so far said in Latin is henceforth called in French which corresponds to a real upheaval for the time. 1939: World War II broke out. Fortunately, the church is only slightly affected, which will be its misfortune afterwards. Abbeville is destroyed almost entirely, it is necessary to rebuild in an emergency. Saint-Jacques is then left out, it is not a major priority. But it is deteriorating more and more, the inclement weather, like this storm of December 2004 that drops an element of the steeple, which then pierces the cover of the nave. The cost of restoration is far too high for a municipality already in debt. In the spring of 2011, it deteriorated further, bringing the city council to its demolition in February 2013. The Abbeville population is mobilizing, hoping to save what still remains to be saved, rising up against some hasty methods of destruction aimed at quickly destroying the church without extracting the organ, the bell and almost all the furniture. Finally, part of the furniture is deposited in the Musée Boucher de Perthes, the organ of 1906, a Mutin Cavaillé-Coll will certainly find refuge in the Collegiate Church of Saint-Vulfran and Jacqueline was extracted once more from its belfry, definitely, in Waiting to be classified in the patrimony of the Historic Monuments. Another bell was saved in-extremis from an auction at the Drouot Hotel in Paris by the municipality. The body of the Abbe Paillart, together with two other priests resting under the choir of the church, were exhumed to find a new burial place. A new place Saint-Jacques then takes shape. It is a square with an engazed parterre which covers the site of the church, resuming its shape and orientation, the two alleys forming a cross. On the site of the choir, a memorial commemorating the veterans and Achille Paillart, a priest who is responsible for rebuilding the church. A small fountain takes the place of the high altar. Images and texts are not royalty-free. If you want to use one of the photos or texts on the site, do not hesitate to contact us and explain how you intend to use them.